Instead of relying on costly professionals whenever you have electric problems in your home or with your car, you can go ahead and purchase a handy multimeter. These are tools that can measure volts, amps, and ohms among other electrical values. They are extremely useful to diagnostic problems in many electrical and electronic fields. Any electrician needs one in its toolbox because otherwise, they can’t safely operate even on some of the most basic kinds of issues. You might also be interested in our articles about the best power conditioners and the best voltage converters. As with all measurement tools, having a good accuracy is essential. This is more of a critical factor to consider if you are a professional because you are probably going to face all kinds of electrical issues every day. In that case, you should really strive to invest in the most accurate multimeter you can afford. If you’re simply a homeowner or DIY hobbyist, you can work well even if you don’t get the most accurate multimeter out there. All multimeters come with a reasonably high input impedance but some are better compared to others in this regard. Having a higher input impedance can be a great help if you’re planning on measuring particularly sensitive electronics. There are lots of things that multimeters can measure, including current, voltage, and resistance. Nowadays, many models will also be able to perform diode checks which could be a neat feature to have. Make sure you can get a multimeter with this ability because it could be very handy. Other important concerns for multimeters are durability and ease-of-use but the ones mentioned in this little guide are pretty much the most relevant today. It’s obvious that everyone wants a simple product to use that will last in time, but these aspects can depend on many factors. On the following list of products, you will discover multimeters that stand out on the market due to their exceptionally great features-per-cost ratio. It doesn’t matter if you have a more limited budget or very demanding needs, this list contains a wide range of multimeters to suit different preferences. Take a look at it to make your decision only from the most trusted and reliable multimeters. With the ability to make precise electronic measurements, the Innova 3320 is a capable multimeter fitting for anyone who needs a handy, easy-to-use tool. It comes with color-coded LEDs, auto-ranging scales, and protective rubber corner guards. This is a safe and accurate product at a very reasonable price so let’s analyze it more closely. Thanks to the added clear labels and the large screen, this multimeter scores high on visibility. Selecting the desired tests is a breeze, as well as viewing the results. Checking the battery level is done through the quick color-coded LEDs where green means ‘good’, yellow is ‘weak’, and red signifies ‘replace’. When it comes to the design of the unit, it seems that the manufacturer opted for an ergonomic construction to suit well both a hands-on and a hands-free testing approach. No need to worry about accidental drops because the unit has rubber corner guards to protect the multimeter. A handy built-in stand enables users to test various electrical parameters without using their hands. When you’re trying to make electronic measurements getting the correct range has always been a difficult thing to do. Instead of having to dial the right range, this multimeter provides auto-ranging scales. It can be used for lots of different applications around the household though it can be put to good use for checking out automotive circuits, vehicle battery and charging systems too. The multimeter has a 10 MegOhm input impedance and provides a single-setting resistance ability for both AC and DC voltage. Other notable features are the auto shut-off and UL listing which ensures the safety and quality of the product. A solid multimeter with lots of convenient features, the Innova 3320 deserves the top spot on this list considering what it can do for its cost. It can be used easily for a wide range of projects delivering great results. Readings in tight places are done with less effort due to the kickstand and the display offers superior visibility. Highly recommended. 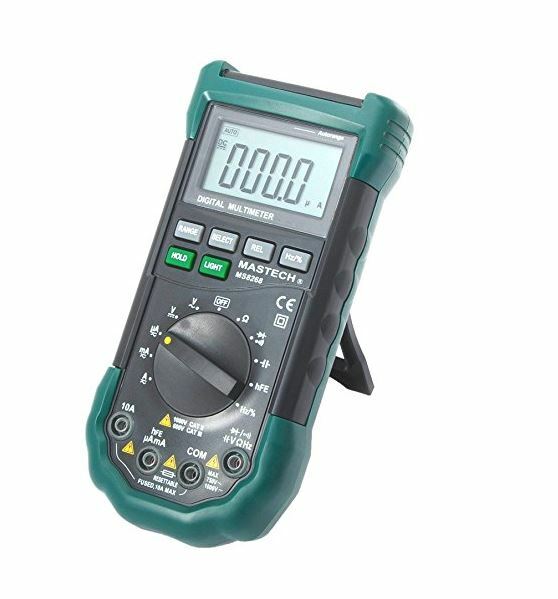 The Etekcity MSR-R500 is a multimeter which can handle a versatile range of measurements from voltage, current, and resistance to diode and continuity testing. At a very low price, it can take care of such a great multitude of measurements with an acceptable level of accuracy. Let’s see the full set of capabilities of this model. On the outside of this multimeter, you can find a rubber sleeve designed to protect the device from wear and tear. It’s fitting for different environments and it can also work without constantly keeping it in your hand thanks to the support stand. The stand is a useful accessory for making reading measurements more convenient. The display of the multimeter comes with a backlight which illuminates the readings in darker areas. Among the measurements that this unit can handle we can count voltage, resistance, current, and continuity. There’s a continuity buzzer in place which assures you that electrical components are still in good condition. With the help of the data hold function, you can maintain some important measurements on the screen while you record them. Some other great features of this multimeter are the low battery indicator and the test lead extension caps that can be removed. In terms of safety, this model makes use of reliable overload protection. There are multiple applications for this multimeter including automotive maintenance, diagnosing household electrical problems or simply engaging in some fun electronics hobbies. When it comes to the latter you can test circuitry for various projects or check the wiring on LED strips. Considering its abilities, the Etekcity MSR-R500 is worth a shot if you’re looking for an inexpensive multimeter which is easy to operate. It can be of great use in the hands of any homeowner or hobbyist as it can accurately diagnose electrical problems. 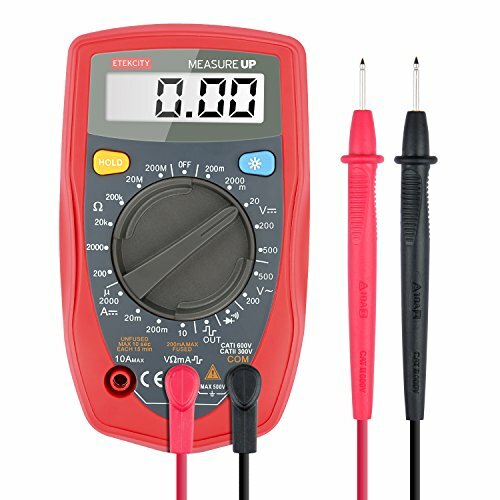 This multimeter is packed with nice features for the cost and it’s a great choice for everyday use. For those who want something a bit more advanced, the Etekcity MSR-C600 is a capable multimeter packed with great features. It has an auto-ranging clamp and it can execute all kinds of important electrical tests including diode and continuity among many others. A convenient carrying pouch is also provided. Safety is taken very seriously by this digital multimeter. You can measure both voltage and AC current without having to break a circuit or to strip a cord. It’s important to be able to obtain results without direct hazardous contact. Handguards are also in place to protect the hands of the user from touching the dangerous zone. Some of the electrical tests you can do with this auto-ranging clamp multimeter are diode and continuity. It also measures AC/DC voltage, resistance, and AC current with solid accuracy. The jaw opening allows for measurements in a conductor that reaches a maximum of 26mm without breaking off the circuit. A sleep mode is available for this unit. When the multimeter registers 15 minutes of inactivity, it will power down to conserve energy. Some great features to increase your productivity are the data hold and max reading functions. The display is also large enough to be seen without too much trouble. The manufacturer includes a pouch to safely carry the multimeter. It’s fitting for those who need to rely on its abilities while on the go. Taking into account how much this digital multimeter can simplify household electricity maintenance, it’s safe to say that Etekcity did a great job with the MSR-C600. With so many capabilities, this multimeter no longer feels expensive. It actually brings a lot of value to the table and this is why it earns a spot on this list. 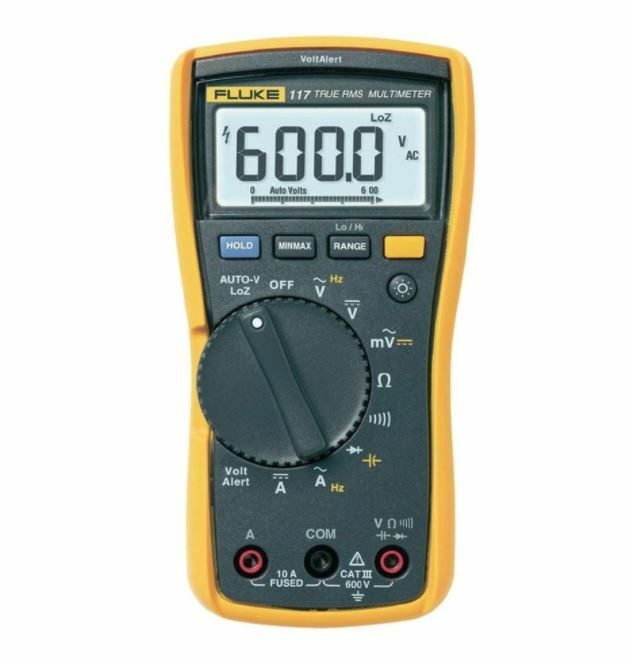 If you’re an experienced electrician and need a truly reliable multimeter, you can’t go wrong with the Fluke 117. This True RMS unit comes with some of the latest technologies, low input impedance, and a large white LED backlight. It’s considerably more expensive but keep in mind that it’s geared towards those who work in professional settings. One of the most interesting abilities included in this unit is the VoltAlert technology which allows for voltage detection without making contact. Automatic selection of the AC/DC voltage can be done via the AutoVolt technology. Those who often run into false readings that can happen because of ghost voltage will surely appreciate the low input impedance of this multimeter. When it comes to construction, this unit has been built with superior ergonomics in mind. It’s compact and can be used comfortably with one hand. If you get an optional magnetic hanger you can operate completely without relying on your hands. Fluke equipped this unit with a high-quality LED display that features a bright backlight. Lots of measurements can be taken and displayed on this multimeter. For superior accuracy, it delivers true RMS on non-linear loads and it can provide readings for frequency, resistance, capacitance, as well as continuity. Some of the best types of applications where this professional unit can work well are electrical maintenance and field service. Troubleshooting various electronic problems is a breeze with such a handy multimeter which doesn’t give you false or ghost voltages and which offers non-contact voltage detection. Rugged and reliable, the Fluke 117 is one of the best digital multimeters you can buy. It’s compact yet powerful enough to handle a vast range of commercial applications including environments such as hospitals and schools. Any electrician who wants to make a smart investment should check this one out. 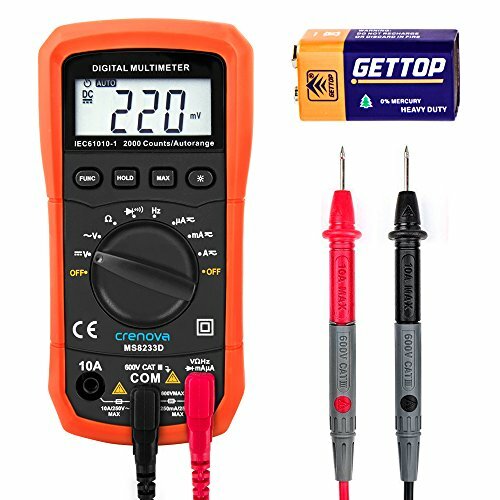 Another solid multimeter is the Crenova MS8233D, a device that comes with a balanced set of features to cover a wide range of uses. It has a generously-sized display and reliable overload protection. Besides its versatile measurement functions, it has some special abilities including Data Hold and Function Switching. Versatility is key for this multimeter. It can be used to do various tests such as resistance, battery, and AC/DC voltage tests. Protection is ensured by a double fuse that comes built-in to make the multimeter dependable against the danger of overloading. Thanks to a backlit LCD you can clearly see the readings even in the dark. If you leave the device idle for some time it will turn off automatically. The idle time for this unit is 15 minutes and to get the multimeter back into action you simply need to change the rotary switch or press a push button. Using this model is simplified by its foldable stand. Simply prop up the device on a stable surface and open up its support stand. Then you can conveniently take notes or do something else with your hands while you use the multimeter. A data hold feature is included for recording the measured value. There’s a dedicated ‘Hold’ button which locks the current reading on the screen. 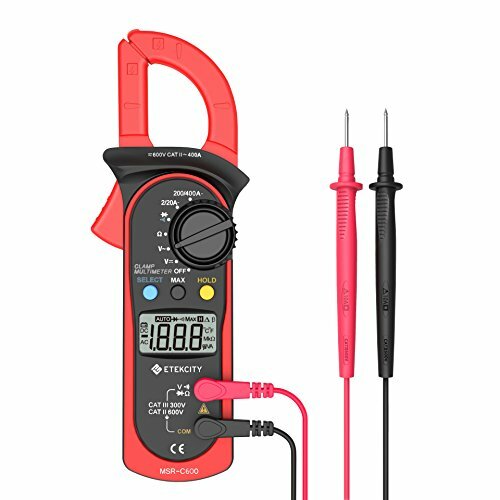 Another great thing about this multimeter is that it provides auto-ranging operation enabling you to pick the correct measurement range according to your particular project. When you consider its value-per-cost ratio, the final conclusion regarding the Crenova MS8233D is a highly positive one. It may not really stand out in particular on the market for digital multimeters, but it doesn’t have to. It simply gets the job done fast and effectively. Compact, durable, and easy to use, this one’s certainly an interesting candidate. Field service technicians who prefer an accurate and safe multimeter should try the Fluke 115. This dependable True RMS multimeter has all the ingredients to help anyone measure continuity, resistance, capacitance, and many others with ease. It has a great safety rating, a compact design, and it comes with a nice carrying case. This model can display True RMS voltage and is ideal for executing some quick verifications. It has been independently tested in CAT III environments to ensure the best level of safety. The compact design combined with the rugged construction makes this an ideal tool for those who appreciate durability and portability. As it features a wide range of tests, this could be a huge help in the hands of any electrician. It measures frequency and capacitance besides being able to handle resistance, continuity, and diode tests. Working in poorly lit areas is possible thanks to the backlit LED white screen which is also fairly large. The multimeter is designed to handle more difficult working conditions so if you require some extra durability, this seems a solid pick. It operates anywhere in between -10 °C to + 50 °C and you can safely store it at even more extreme temperatures. This one’s a nice value bundle which also includes a soft carrying case. It’s not made specifically for this model as it can handle other Fluke test tools and various accessories too. It’s made of high-quality polyester and integrates a secure Velcro strap. 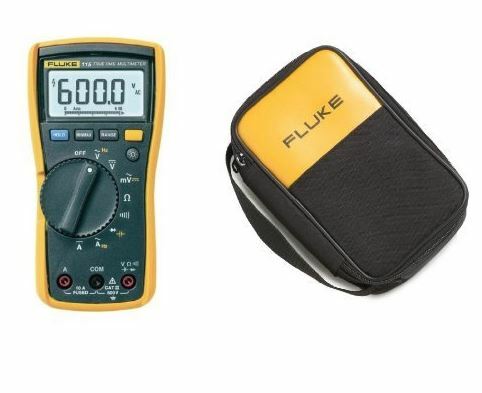 Fluke is known in the industry for its high-quality standards and the 115 model can really attest to this reputation. It’s a solid multimeter in all regards which can be used without too much effort whether you’re a professional or just an enthusiast. For this cost, you’ll have a hard time finding a better-featured unit. For those who want a reasonably-priced digital multimeter that offers all the tools needed for good measurements, the Mastech MS8268 appears to be a solid option. It provides some decent features for its cost including a LED/sound warning for the jacks. The construction seems sturdy and the unit looks capable to measure pretty much anything. With the help of a convenient data hold function, this multimeter is able to keep the current readings on the screen. If you’re in the auto-scale mode, the function will automatically switch the device to the manual range mode. The display is capable of a maximum of 3999 readings, shows symbols, and lights up for working at night. Users can choose between automatic and manual measurement modes. Safety-wise, the multimeter comes equipped with a reliable built-in fuse and it respects the IEC-1010 standard for electronic measuring instruments. Also worth mentioning is the compliance to CAT II and CAT III and the second pollution degree. Whether it’s DC/AC voltage, resistance, frequency, or capacitance, this multimeter can deal with any important measurement. It works for reading AC and DC current too. A built-in buzzer will sound when you measure a resistance under 50 ohms. In terms of design, this multimeter has a key area right beneath the LCD screen and a rotary switch with socket entrances occupy the rest of its front panel. On the back of the device, you can find the handy support stand for hands-free operation of the test tool. A double-insulation protective jacket surrounds the whole multimeter and at the top, there’s a non-contact voltage sensor. Considering the potential of this digital multimeter, it can be said that the Mastech MS8268 is worth the money. It may not be as accurate as some other units, but for most home users this should be more than a satisfying option. There are lots of features and functions with a focus on a simpler operation so this is recommended. One compact digital multimeter to take into account is this one from AstroAI. It’s an excellent tool for troubleshooting various electrical problems. There are some nice features to simplify the operation process including a large digital display and the Data Hold function. The price seems reasonable so let’s see if it’s a good investment. With the help of two explosion-proof fuse tubes, this unit delivers when it comes to protection. There’s reliable protection against overload on all ranges thanks to the effective F400mA/600V and F10A/600V fuses. A neat feature is the addition of a multi-function socket which can be used to measure either transistors or capacitors. Freezing data on the large LCD screen is possible thanks to the included data hold function. This makes it easier to use the current reading and if you ever find yourself having to work in the dark, the screen is backlit to increase the visibility. Other useful abilities to help with the taking of the measurements is the hanging magnet and kickstand. Troubleshooting electrical problems has never been easier. This tool is intuitively-designed to aid anyone who needs to take some electric measurements, but it’s also a decent option for people who need electronics training. One simple test you can do with this multimeter is the continuity test which is done by connecting the test leads to the points on the tested circuit. This tool is capable of doing other tests too. You can try measuring the temperature of an object. After you carefully attach the thermocouple to the desired object you need to wait for the reading to settle. The resulting temperature is displayed on the screen. 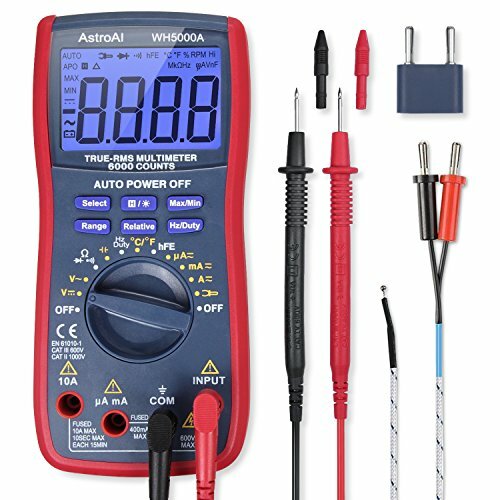 Designed for solid safety and accuracy this multimeter from AstroAI represents a reliable tool to have in any home. It works just as you’d expect and it feels well built with the right size to comfortably handle. Overall, this unit boasts great value for its cost and this is why it shouldn’t be left out if you’re searching for a high-quality multimeter.